Sorry... the 2017 Toyota Camry is no longer being sold as new. Instead, take the first step to a great deal on 2019 Toyota Camry with a free price quote! Navigation and JBL audio system come standard for XLE and XSE trims. The 2017 Toyota Camry remains one of America’s most popular family sedans. It competes with the Honda Accord, Hyundai Sonata, and Ford Fusion. Four trims are available: the LE, SE, XSE, and XLE. The available hybrid versions of the Camry will be covered in a separate overview. 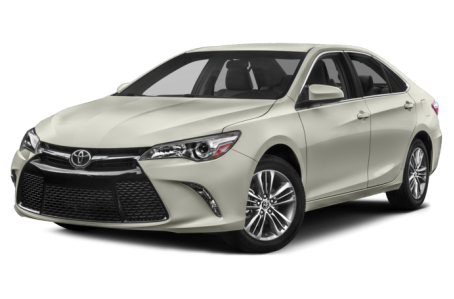 The Camry has the typical characteristics of a plain, family-car with exception to its massive front grille, which take design cues from the Lexus lineup. Standard features include power/heated side mirrors and power windows locks. LED headlights, LED daytime running lights, a power moonroof, and sport-tuned suspension are available. Under the hood, the Camry is powered by a 178-hp, 2.5-liter 4-cylinder engine mated to a 6-speed automatic transmission. A 268-hp, 3.5-liter V-6 engine is also available. Fuel economy for the Camry 4-cylinder is an EPA-estimated 24/33 mpg city highway. With the V-6, the rating drops to 21/30 mpg. Inside, the Camry has a spacious, cloth interior with faux wood grain trim. The center console features Toyota’s Entune multimedia system, which include 6.1-inch touchscreen, Bluetooth connectivity for phone and audio, a USB port, and Siri Eyes Free mode. Remote keyless entry, a 60/40 split-folding rear seat, cruise control, a tilt/telescoping steering wheel, and power windows/locks also come standard. Optional features include leather-trim upholstery, a larger 7-inch touchscreen, paddle shifters, dual-zone climate control, adaptive cruise control, push-button start, an integrated navigation system, a JBL premium audio system, and a wireless smartphone charging station. Standard safety features include front airbags, antilock brakes, an electronic stability system, a tire-pressure monitoring system, and a backup system. Available features include a blind spot monitoring system, rear cross-traffic alert, and pre-collision assist. 253 of 257 (98%) consumers said they would recommend this vehicle to a friend.